﻿ Hebrews 7:11 Now if perfection was through the Levitical priesthood (for on the basis of it the people received the Law), what further need was there for another priest to arise according to the order of Melchizedek, and not be designated according to the order of Aaron? 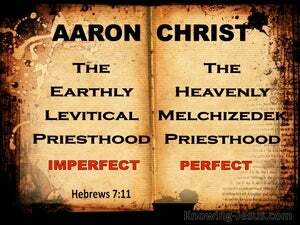 If, then, perfection came through the Levitical priesthood (for under it the people received the law), what further need was there for another priest to arise in the order of Melchizedek, and not to be described as being in the order of Aaron? Now if there was perfection through the Levitical priesthood (for under it hath the people received the law), what further need was there that another priest should arise after the order of Melchizedek, and not be reckoned after the order of Aaron? So, if perfection [i.e., a right relationship with God] could have been attained through the Levitical priesthood, (for under it people had received the law of Moses), what further need would there have been for another priest to arise, according to the order of Melchizedek, who was not considered "according to the order of Aaron"? If, then, there had been a perfect expiation by means of the Levitical priesthood, (for with reference to it, the people received the law,) what further need was there that another priest should be raised up after the order of Melchisedec, and not be called after the order of Aaron? Now if it was possible for things to be made complete through the priests of the house of Levi (for the law was given to the people in connection with them), what need was there for another priest who was of the order of Melchizedek and not of the order of Aaron? Now if perfection could have been through the Levitical priesthood (for on the basis of it the people received the Law), what further need was there for another priest to arise according to the order of Melchizedek, and not one designated according to the order of Aaron? If therefore the Levitical priesthood, concerning which the people received a law, could have given perfection, what further need was there that another priest should rise, to be named after the order of Melchisedec, and not after the order of Aaron? If indeed then perfection were by the Levitical priesthood, for the people had their law given to them in connexion with it, what need was there still that a different priest should arise according to the order of Melchisedec, and not be named after the order of Aaron? Then indeed if perfection was through the Levitical priesthood, for unto it the people have been tithed, what need is there still that another priest shall rise after the order of Melchizedek, and not be called after the order of Aaron? Now if anything final had been really accomplished through the Levitical priesthood, for even the giving of the Law was based upon it, what further need would there have been of appointing a different priest of the priesthood of Melchizedek, instead of choosing one of the priesthood of Aaron? If then perfection were by the Levitical priesthood, (for under it the people received the law) what farther need was there that another priest should rise, after the order of Melchisedek, and not be called after the order of Aaron? If therefore perfection were by the Levitical priesthood (for under it the people received the law), what further need was there that another priest should rise after the order of Melchisedec and not be called after the order of Aaron? If truly therefore completion were by the Levitical priesthood, (for the people received legislation by it,) what further need according to the order of Melchisedec for another priest to be raised, and not according to the order of Aaron? If therefore perfection were by the Levitical priesthood, (for under it the people received the law,) what further need was there that another priest should rise after the order of Melchizedek, and not be called after the order of Aaron? Thus if perfection was through the Levitical priesthood, for on the basis of it the people received the law, what further need [is there] for another priest to arise according to the order of Melchizedek and not said to be according to the order of Aaron? Therefore if perfection were by the Levitical priesthood (for under it the people received the Law), what further need was there that another priest should rise after the order of Melchizedek, and not be called after the order of Aaron? If now therefore perfection came by the priesthood of the Levites - for under that priesthood the people received the law - what needed it furthermore that another priest should rise, after the order of Melchizedek, and not after the order of Aaron? Now if there were perfection through the Levitical priesthood, (and it was under it that the people received the Law) why was it still necessary for another kind of priest to arise, after the order of Melchizedek, instead of being reckoned according to the order of Aaron? 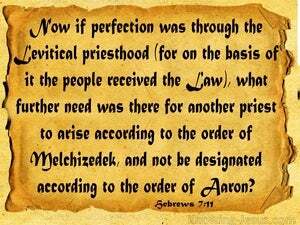 So if perfection had in fact been possible through the Levitical priesthood -- for on that basis the people received the law -- what further need would there have been for another priest to arise, said to be in the order of Melchizedek and not in Aaron's order? If indeed perfection had been by the Levitical priesthood, (for under it the people hath received the Law,) what further need was there that a different priest should arise after the order of Melchizedek, and not be called alter the order of Aaron? If therefore there was perfection through the Levitical priesthood,? ?or the people received the law under it,? ?hat need was there that another priest should arise after the order of Melchisedec and not to be called after the order of Aaron? If indeed, therefore, there had been, a perfecting through means of the Levitical priesthood, - for, the people, thereon, have had based a code of laws, what further need, according to the rank of Melchizedek, for a different priest to be raised up, and, not according to the rank of Aaron, to be designated? If therefore there was perfection by the Levitical priesthood (for under that the people had the law given to them), what farther need was there that another priest should arise after the order of Melchisedec, and not be called after the order of Aaron? 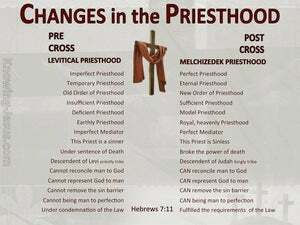 If, then, Perfection had been attainable through the Levitical priesthood--and it was under this priesthood that the people received the Law--why was it still necessary that a priest of a different order should appear, a priest of the order of Melchizedek and not of the order of Aaron? If therefore perfection were by the Levitical priesthood (for under it the people received the law) what further need was there that another priest should rise after the order of Melchisedec, and not be called after the order of Aaron? Now if the crowning blessing was attainable by means of the Levitical priesthood--for as resting on this foundation the people received the Law, to which they are still subject-- what further need was there for a Priest of a different kind to be raised up belonging to the order of Melchizedek instead of being said to belong to the order of Aaron? Now if perfection had been reached through the Levitical priesthood -- for on it as a basis even the law was enacted for the people-- what further need would there have been of appointing a different priest, with the rank of Melchizedek, instead of designating one with the rank of Aaron? If, therefore, there was perfection through the Levitical priesthood (for under it the people have received the law), what further need was there, that another Priest should arise according to the rank of Melchizedek, and not be reckoned according to the rank of Aaron? Now if perfection were by the Levitical priesthood, (for under it the people received the law) what farther need was there that another priest should arise after the order of Melchisedec, and not after the order of Aaron? 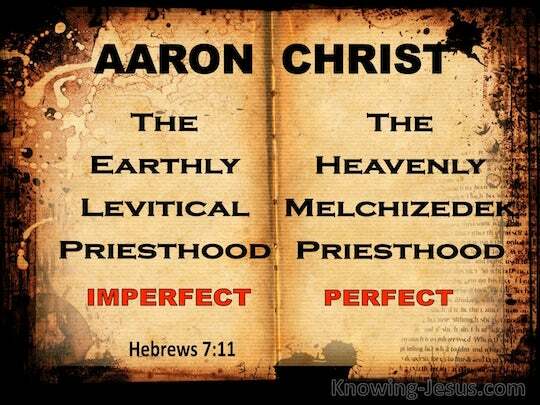 If indeed, then, perfection were through the Levitical priesthood -- for the people under it had received law -- what further need, according to the order of Melchisedek, for another priest to arise, and not to be called according to the order of Aaron? 10 for he was still in the loins of his father when Melchizedek met him. 11 Now if perfection was through the Levitical priesthood (for on the basis of it the people received the Law), what further need was there for another priest to arise according to the order of Melchizedek, and not be designated according to the order of Aaron? 12 For when the priesthood is changed, of necessity there takes place a change of law also. "I do not nullify the grace of God, for if righteousness comes through the Law, then Christ died needlessly."